Scrolling through high end fashion brand’s collections always excite me. But in particular, scrolling through Gucci caught my eye. I really do love all of Gucci’s collections at the moment. There’s always something simple, classy, elegant, feminine or quirky in most collections which make me think ‘YES I NEED THIS!!’. So, following my endless scrolling through Gucci‘s collections, I thought I’d make a little wishlist on my favourite dress, bag and shoes from there. 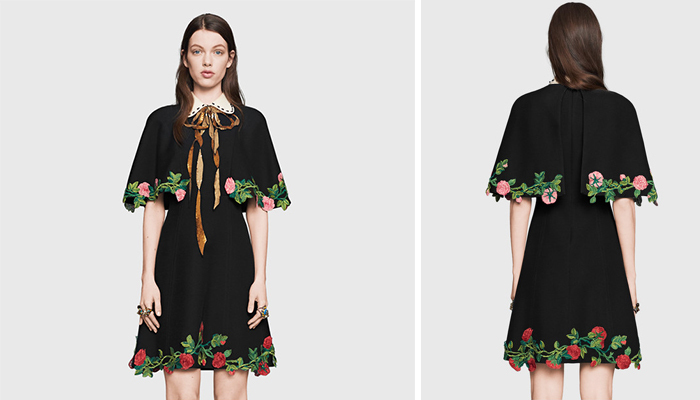 This Embroidered Wool Silk Cape Dress is super gorgeous and elegant. I love the style of this dress with the flattering sleeves and the plain black print with embroidery details. The sequin embroidery along the neckline is gorgeous and compliments the floral patterns quite well. This is certainly an elegant dress which can be paired with different handbags and shoes to either dress it up or dress it down for a more casual style. I’m not going to lie – I did definitely go through a bag phase a while back and bought quite a few bags. As I am still in the bag craze phase, picking out one bag from the numerous ones on Gucci was a bit of a struggle. I definitely wanted everything on there! 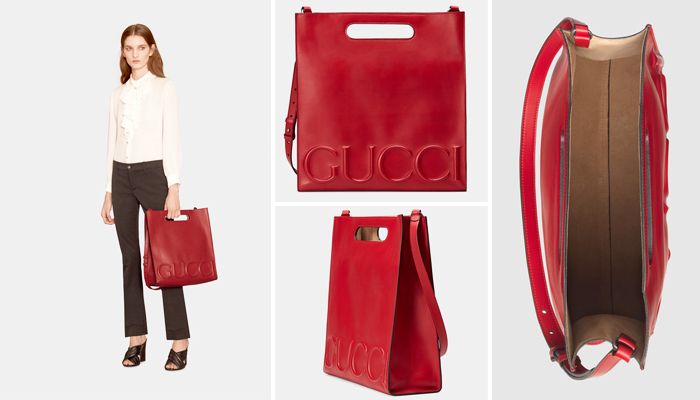 But, when I saw this Gucci XL Leather Tote in Hibiscus Red Leather, I was sold. Isn’t the whole style, colour and detailing of this bag gorgeous?! It’s a perfect work or casual bag as it looks very smart and sophisticated. I love the handle on this as well – such a cute tote! These shoes, oh my god! I don’t usually go for studded detailing on clothes, jackets, bags or shoes but when I saw this Studded Leather Platform Pump, I just couldn’t pass it up. It’s just gorgeous with the striped navy blue and cream pattern – very nautical but in an elegant way. I love the addition of gold studs and detailing as it adds a touch of class to this. Ahh WANT! Are you a fan of Gucci’s collections?